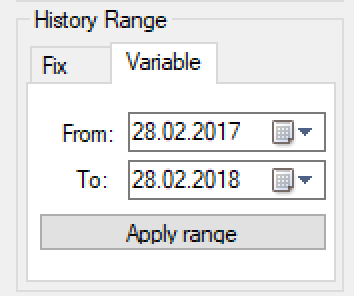 Custom Dates (back-testing) in QuantTrader? Home › Forums › Logical Invest Forum › Custom Dates (back-testing) in QuantTrader? This topic contains 2 replies, has 2 voices, and was last updated by TOM 1 year, 1 month ago. One area I have been unable to find is the ability to use a “custom dates” option of back-testing strategies and meta strategies. The reason I would like to do this is based on Frank’s New Year’s letter noting the likelihood of inflation and volatility returning to the markets. Simple back-testing does not help with forward-planning when the investment environment has a strong likelihood of change. So, I would like to test my strategies & meta strategies during times when similar events occurred. For example, I would like to back-test a meta strategy over an isolated period when inflation was increasing, or when there was a prolonged correction in the overall markets, etc. Perhaps the ability to check performance over a specified time period is available and I just haven’t found it – need some help here… If not, IMO, the option in the back-testing box to select a specific date range is a much needed and valuable feature. (and to think, I was only 1 click away…) Thanks, onward and upward!